Israel was created as a new state in 1948. This ever-cosmopolitan Middle East country is bordered by Egypt, Jordan, Syria and Lebanon. The four main areas comprise: the fertile and densely populated Mediterranean coastal plains; the Negev desert to the south; the Great Rift Valley running the length of the eastern borders to the Gulf of Aqaba; the central hills ranging from Galilee in the north to Judea in the centre. The river Jordan flows south along the Great Rift Valley and into the Dead Sea, the lowest place on earth. The cooler northern highlands experience heavy rainfall in the winter, but there is little rainfall to the south. Summers are hot and dry. Although most of the original evergreen forests were depleted, efforts are now being made to re-forest with conifers, eucalyptus and citrus trees. Scrub is the main vegetation, and several wildlife nature reserves help preserve an abundance of wildlife. 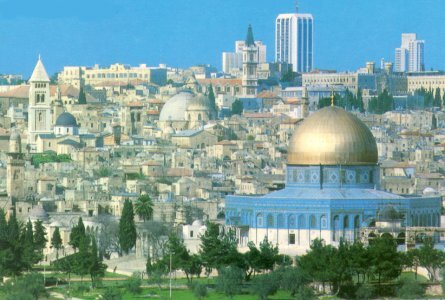 The hinterland of Palestine is significant not only for Jews throughout the world, but also for Christians and Muslims. 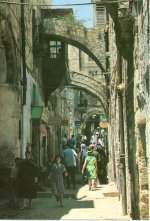 Because the Jews' claim to the land conflicts with that of the Palestinian Arabs, the ancient historical ties for both has led to ongoing hostilities between Israel and neighbouring Arab countries - not that this keeps visitors of all nationalities from visiting this country, principally because of its religious significance. We docked at Haifa and set off in a bunch of coaches (buses) heading for Bethlehem. Our guide, the one with the three degrees (not the pop group), told us all about Israel, and very interesting it all was too. All about kibbutz life, for example, learning that adults normally have their own private quarters but children are all housed together; sounds a great plan to me! It was especially interesting, as Christians, to see this Biblical land. Yet it has to be said, you are sometimes better off with your imagination. It was especially interesting, as Christians, to see this Biblical land. Yet it has to be said, you are sometimes better off with your imagination. When you have held onto imaginings for so many years, it can be a bit of a shock to find that reality is rather different. Yet there were pluses and minuses in this respect. I had imagined far more desert and scrubland and was pleasantly surprised by how green it was in some areas. 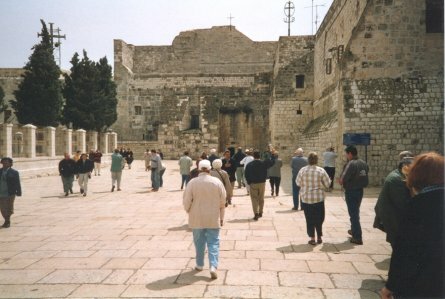 Everyone, of course, makes straight for the Church of the Nativity Grotto in Bethlehem. Inside it is rather barn-like, and you have to detour around the side and down steep stairs to get to the area where it is believed that Christ was born. If you are sensitive to the feel of the Spirit you cannot fail to detect something here. In awe you follow the queue through the lower areas of the church and pass the spot where the baby called Jesus born. 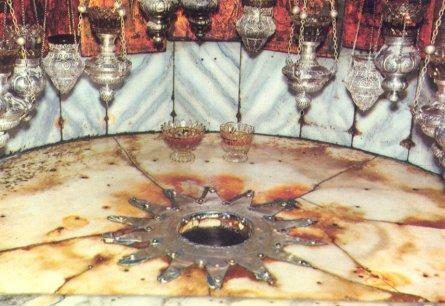 On the spot there is a marble slab set with a golden star - such a contrast to what it must have been like then. When you take into consideration the continued worship that has taken place at this spot for over 2,000 years, it really does make what you have read in the Bible seem all the more vivid. The gift shops in Bethlehem majors in wooden goods: an entirely appropriate commodity for Jesus, the carpenter. Here you can get just about anything you can think of from the bible realized in wood: from camels to cribs. We departed in rain hoping that, at Jerusalem, it would at least be fine. Surely it wouldn't rain there? It did rain in Jerusalem! Such is our luck. About 5 days a year this might happen. We chose one of them. Typical! We tramped through the street bazaar, a place with awesome character when you take into account that little has changed here since the time that Jesus trod these streets. We visited Golgotha, following the approximate route taken by Jesus as he carried his terrible cross. Now that hill is virtually impossible to visualize with the more modern building and the church over the spot where the three crosses were located. Inside is a booth which is right over the spot where they crucified Jesus. What an emotional place! Jerusalem is a place where you definitely need a lot of time to wander and appreciate everything. 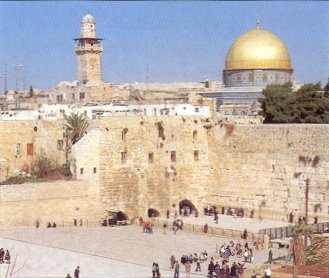 Especially if you are a Christian, Armenian, Jew or Muslim; each of these religions has their own quarter of Jerusalem. I certainly need to go back! Then we made our return to Haifa, passing the not-as-high-as-I-would-have-liked Mount of Olives, ready to queue again for our photos and dinner. If you enjoyed reading the above article then you will probably also enjoy Tenerife by Ed, and the Scottish island of Eriskay, also in Europe, and our latest articles covering the Orinoco Delta, La Mata, Marbella and Beijing.